High dynamic range – or HDR – photography has taken a lot of flak over the last few years. This is primarily due to poor execution, resulting in unrealistic or even garish images. It doesn't have to be that way, and shouldn't discourage you from using the technique. If shot and processed properly, this technique can result in natural-looking, amazing images that would not otherwise be possible due to limitations in camera sensor technology. Even though camera sensor technology has improved dramatically in recent years, there are still times that all the tonal values in a scene cannot be captured in a single image. That's where HDR comes into play. Luckily for us photographers, it has become quite simple to create HDR images. Creating these images used to require the use of Photoshop or third-party software plug-ins. 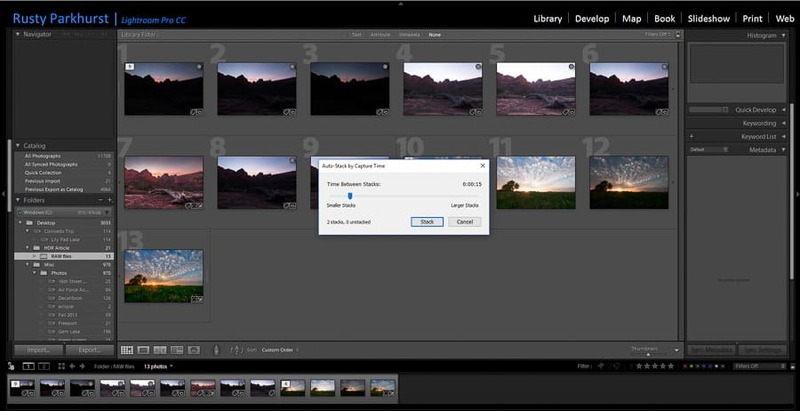 Beginning with Lightroom 6/CC 2015, this can now be accomplished without leaving Lightroom. This feature has also carried over to the “improved” Lightroom Classic CC, but is not available in the new version of Lightroom CC. This article will provide a simple step-by-step guide to using the Photo Merge > HDR feature to create natural-looking HDR images without ever leaving Lightroom. 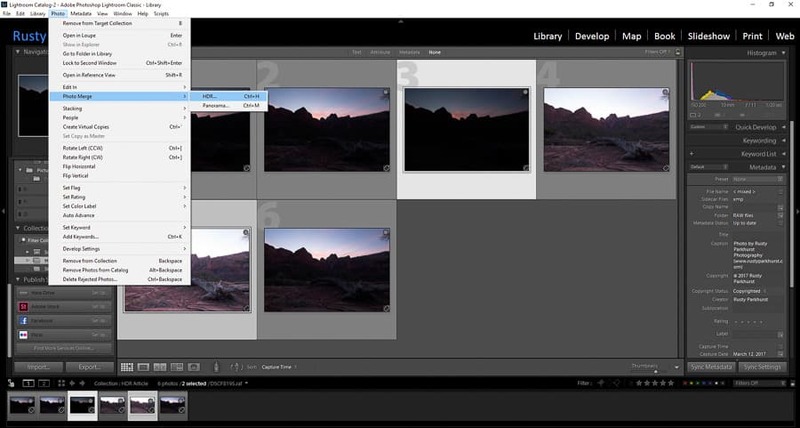 This process should work and look the same whether you are using Lightroom 6, Lightroom CC (2015), or the latest version titled Lightroom Classic. 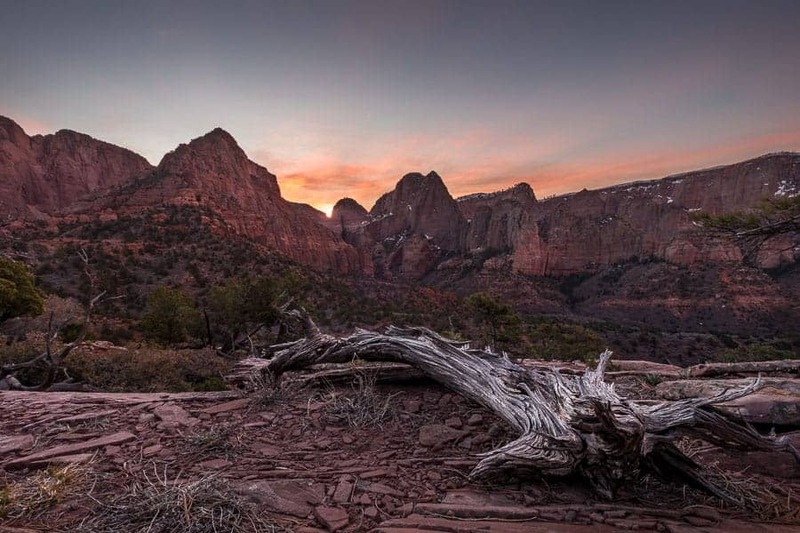 Kolob Canyon, Zion National Park, at sunrise. I may have pushed this HDR too far…which is easy to do. Photo by Rusty Parkhurst. The conversation about HDR – and more specifically dynamic range – can become quite complicated and is far beyond the scope of this article. Simply put, HDR means that the range between the brightest highlights and darkest shadows in a scene is very high. This is known as the dynamic range. If only our camera could capture a scene just the way our eyes see it, one of the biggest photographic challenges would be solved. Unfortunately, it doesn't work out that way. The much superior optics of the human eye have a dynamic range somewhere in the neighborhood of 24 to 30 stops. The sensors in today's cameras pale by comparison, boasting of a dynamic range of 11 to 12, or even 14 stops. The very best performing cameras in this arena, such as the new Nikon D850 and the just-announced Sony A7R III, have a dynamic range of 14.8 and 15 stops, respectively. Those are amazing specs, but still no match for our own eyes. Oftentimes, especially in landscape photography, the dynamic range of a scene is simply too high to capture in a single image. In other words, if the camera is set to properly expose for the brightest tonal values, then much of the shadow detail will be lost in total blackness. Conversely, if the darkest shadows are properly exposed, then much of the highlight information will be lost. 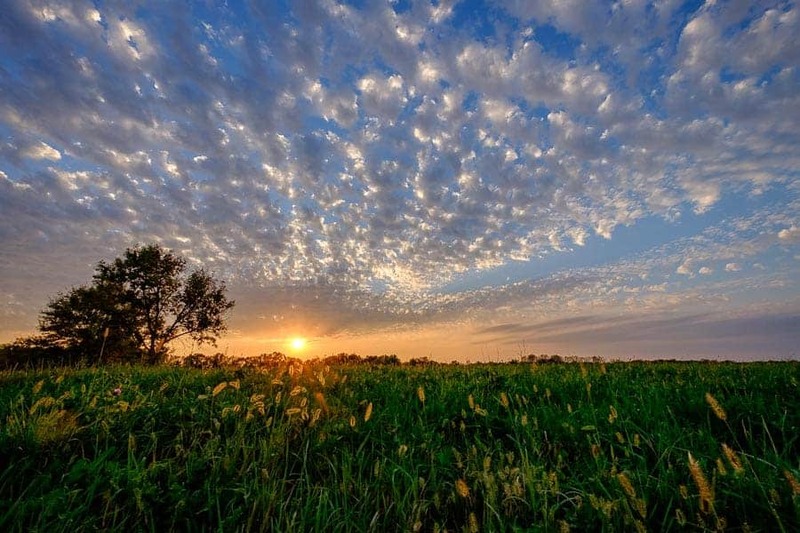 In these situations, multiple images may be captured of the same scene at different exposure values – known as exposure bracketing – to cover the entire dynamic range. The magic of creating an HDR image really happens in the computer. Multiple exposures – commonly 3, but sometimes as many as 5, 7, or even 9 images – are merged in post-processing software to generate a single image with an expanded dynamic range. The final result will be an image with properly exposed highlights and shadows, with little or no lost detail. The decision to bracket exposures for an HDR should be made on a case-by-case basis. As a landscape photographer, I'm commonly shooting near sunrise or sunset, when the shadow areas can be quite dark and highlight areas very bright by comparison. I will often shoot 3- or 5-exposure brackets in these situations, even if I sometimes only use one of the images in post-processing. If shooting into the sun, then HDR is almost always a given. One exception would be if you want to expose for the highlights and let the foreground become a silhouette. There are other scenarios where HDR is important. One such case is real estate photography. When photographing the interior of a building with windows, the difference in exposure values between the inside of the building and outside the windows is huge. Depending on if you want to show what is happening outside the windows, bracketing exposures and creation of HDR images will be necessary. This sunset HDR is a merge of 3 bracketed images, each 1-stop apart. Photo by Rusty Parkhurst. If you are a Lightroom 6 user or subscribe to Adobe's Creative Cloud versions of Lightroom, then making HDR images has never been easier. With just a few clicks of the mouse, a series of images can be merged and ready for final adjustments. The best thing of all is that there is no 'round-tripping' to Photoshop or a plug-in. This keeps things much simpler, saves time, and the results can be quite good. 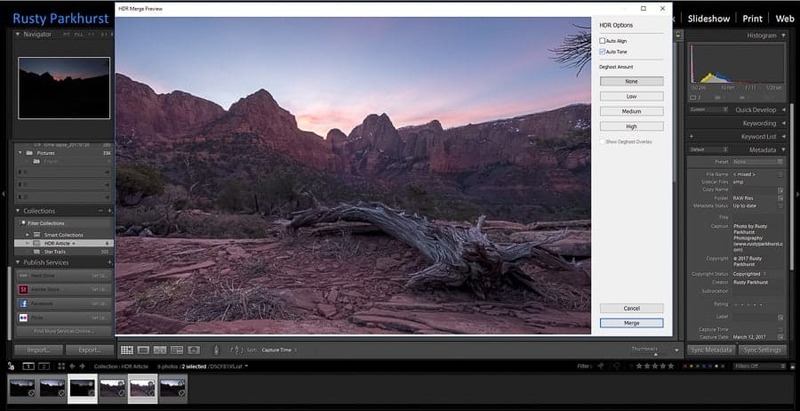 Let's take a closer look at Lightroom's Photo Merge feature and how it is implemented to create great HDR images. For the sake of this article, I'll assume that you have already imported your images into Lightroom. The first thing to do is decide which images are going to be used for the HDR merge. You may or may not want to use all of the bracketed images. More on that later. After deciding which images to use, make sure that each of them is selected. This can be done within either the Library or Develop Module. I shot two, 3-image brackets of this scene. Only the brightest and darkest images were used for the merge, with 5-stops of exposure difference between them. After selecting the images to be merged, go to Photo > Photo Merge > HDR. Alternatively, right-click on one of the selected images and go down to Photo Merge > HDR. The keyboard shortcut for this is Ctrl+H. This brings up the HDR Merge Preview window. Within this window is a preview image of the merged files and three main options to choose from before the final merge. Note that the preview image may not look much different than some of the original bracketed images, and will likely look flat. That is by design, as the final merged image is the RAW data and still needs to be processed. The Photo Merge > HDR option is in the Photo Menu. You can also right-click on any of the photos and get to it that way or use the keyboard shortcut Ctrl+H. Note that I have highlighted only the two images that are being used for the merge. On the right side of the HDR Merge Preview window are three main options to consider prior to the final merge. Auto Align: With this option selected, Lightroom will attempt (and do a pretty good job of it) to align images if there was movement between shots. If the camera was mounted on a tripod, this option may not be necessary. Auto Tone: Selecting this option will show the merged preview image with some basic tonal adjustments applied. The adjustments will likely include decreasing the highlights, raising the shadows, and adjusting the white and black point in the image. This provides more balance in the image and will give you an idea of how much leeway you will have to work with the tones. Note that Auto Tone in the HDR preview window is the same as the Auto button in the Basic Panel of Lightroom's Develop Module. I typically leave this option unchecked since final adjustments will be made later anyway. Besides, I usually don't like how the image looks with this turned on, as it has that “HDR look”. Deghost Amount: This feature is used to eliminate or minimize “ghosting” that is caused by movement of objects in the scene that occurs between shots. The deghosting algorithm masks out pixels that have moved between frames and replaces them with pixels from the base exposure. This can work well for moving people, cars, clouds, or vegetation.The more movement there is, the higher the amount of deghosting you will want to select. Checking the “Show Deghost Overlay” box provides a visualization of what parts of the image are masked. If there is no moving objects in the frames, you will obviously select “None”. Otherwise, use the lowest setting possible to achieve the best image quality. It is important to note that the HDR options will remain in the same state you left them the next time Photo Merge is used. Depending on the image, the options that you need to turn on may be different the next time around. The HDR Merge Preview window. Note the HDR Options on the right side. The HDR Merge Preview window with Auto Tone selected, which gives the image the “HDR look”. The Deghosting option is useful for masking out movement between frames. Clicking on “Show Deghost Overlay” provides a visual indicator of the areas where masking has been applied. After getting the preview image looking the way you want it, it's time to click the Merge button to finalize the image. This will merge the image files using the options that were selected and the final merged image will be added to the Lightroom filmstrip. The resulting image is a 16-bit DNG file, which is Adobe's raw file format. Since the merged image retains the raw data from the individual images, there is tons of information to use for editing the final photo. The darkest and brightest bracketed images are on top. The bottom is the merged image, before applying any edits. 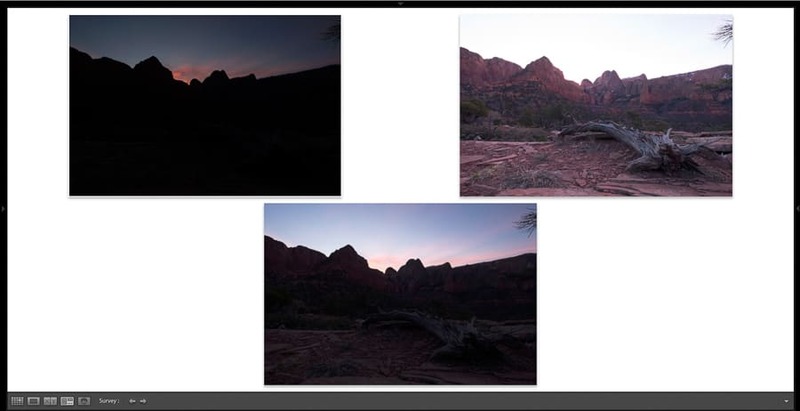 The merged image in Lightroom's Develop Module. The Auto Tone button has been selected in the Basic Panel. Now the fun really begins. The computer has done most of the work to this point, but now you can apply your own artistic edits and style to the final merged image. As you move sliders around in Lightroom, you will notice there is a lot of detail to be pulled out of the image. For example, the exposure slider, which normally has a range of -5 to +5 stops, now has twice the range. 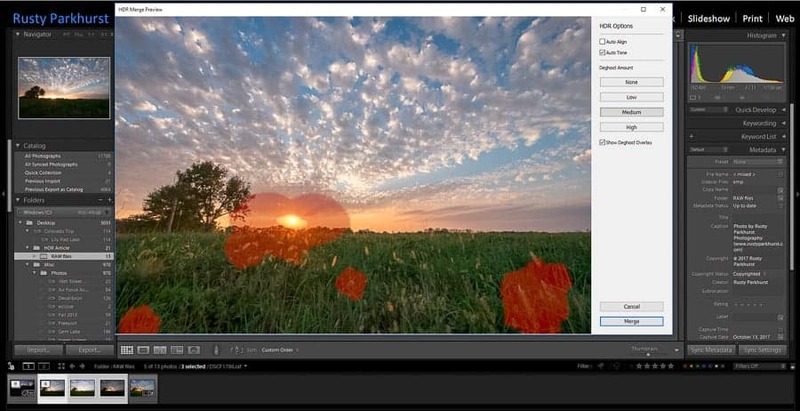 Pulling the highlights down will recover detail in the brighter areas and the shadows slider will do a great job of brightening the darker areas. Apply all the edits you want or use presets to your heart's content. As with all other image editing in Lightroom, these edits are non-destructive, meaning you can undo anything at any time or reset and start all over again. The RAW HDR image is on the left. On the right is the final, edited HDR shown at the top of this article. Using the HDR merge feature in Lightroom is a relatively simple, with only four basic steps following import to final image. However, there are a few tips that can speed up the process even more and also help you get the best results possible. This tip applies to most all types of photography, and probably sounds like a broken record. Shooting RAW preserves all the image data, which is especially important for recovering highlight and shadow detail. Using the RAW file format really is important. In my opinion, it should be what you use by default. If you ever must shoot JPEG, that is fine. Just don't forget to switch the camera settings back to RAW when you are finished. Whether you shoot 3 bracketed images, or 5, 7, or even 9, it's quite possible you don't need all of them to create the HDR. This will take some trial and error and experimentation to determine what works best for you. Try using just two of the images – one at two stops under and one at two stops over the normal exposure. This will speed up the merging process and may be all you need to get the desired results. Don't spend time editing the bracketed images prior to merging. The image adjustments will not be preserved during the merging process. You can apply lens corrections before merging and those settings will be carried over. However, save all other edits for the final merged image. 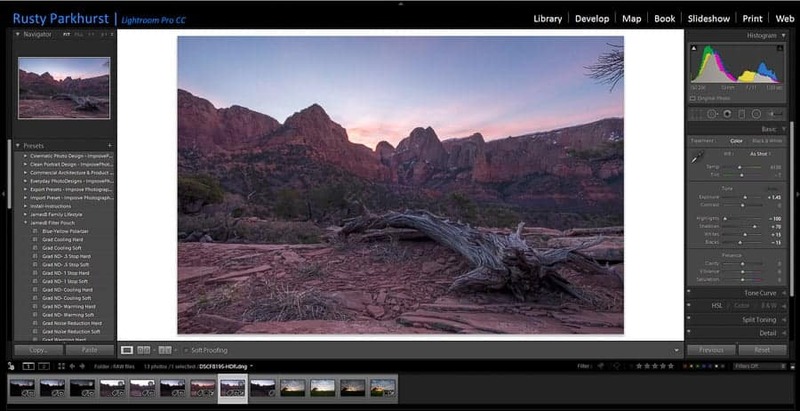 This tip won't necessarily make better HDRs; however, it will help keep your images organized. Better organization means a more efficient workflow. More efficient means faster. Faster is better. With a card full of photos, it can be cumbersome to keep track of all the bracketed images, and figuring out which ones go together. Stacking each set of bracketed images can help get everything organized and much easier to work with. First, import all the images into Lightroom. While in the Library Module, go to Photo > Stacking > Auto-Stack by Capture Time. A pop-up window appears, with the option to set the amount of time between stacks. This works on the premise that each set of bracketed images are captured within just a few seconds. For daytime shots, a setting of 10 seconds generally works well for me. For longer shutter speeds, used for night photography, this time setting would need to be much longer. With the time set, click on Stack. 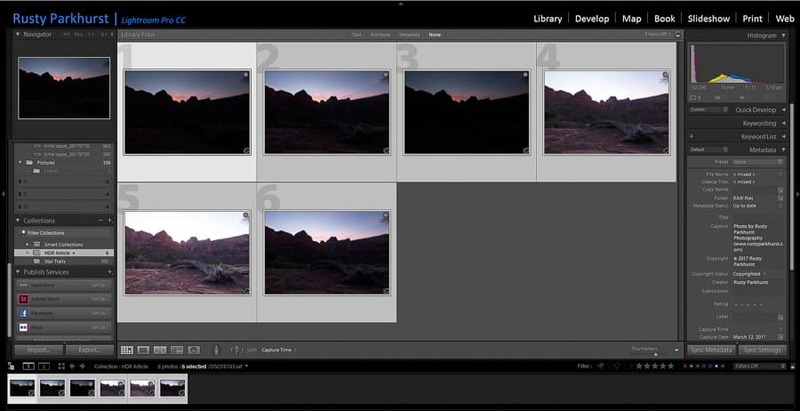 Lightroom will use the time stamp on the images to determine which ones should be grouped together. Back in the Photo Menu or by right-clicking on any of the photos, go to Stacking > Collapse all Stacks. Each set of images that are within the specified time will be stacked together. The small white box (it looks like a stack of white boxes) in the upper left corner of an image indicates that it is a stack. The number in the box indicates how many images are in the stack. Each stack can be expanded or collapsed at any time. The Stacking feature in the Photo Menu. Do this within Lightroom's Library Module. Setting the time between stacks in the Auto-Stacking feature. In Step #3 above, I mentioned that the HDR options settings from the previous session will be retained the next time Photo Merge is opened. 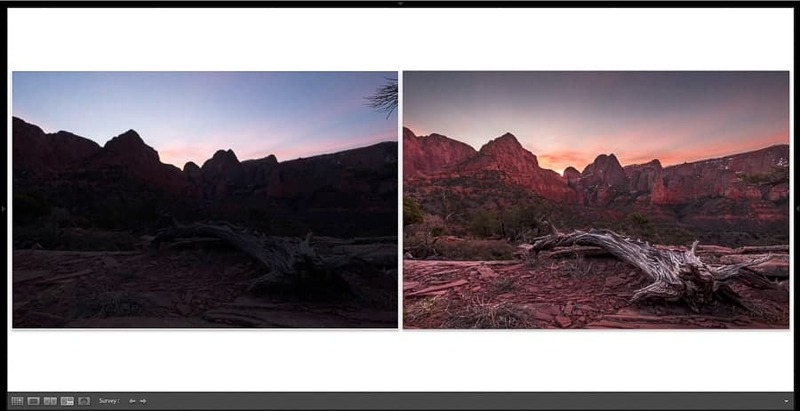 After you have completed the HDR merge, select any two photos and re-open the preview window. Deselect all of the options and click Cancel so that no additional HDR image is created. It only takes a few seconds and can be helpful for using shortcuts (see below). Seems like I'm always pressed for time. Who isn't? Although I enjoy the creative process of editing my images, if there is a way to speed it up, then I'm all for it. There are at least a couple of ways to bypass the HDR preview window. By holding the Shift key while clicking on Photo Merge > HDR, the merging process will take place in the background while you do other things. Using the keyboard shortcut Ctrl+Shift+H after selecting the images to be merged will do the same thing. Using these shortcuts means you won't get to see a preview. However, if the images were shot on a tripod, there was little or no movement in the scene, and you reset the HDR options as indicated in the previous tip, there really is no need to see a preview anyway. Besides, if something doesn't look right, you can always perform the merge again using the preview. This one goes along with Tip #6. Post-processing is extremely important, as that is where our creativity and artistic style is expressed. However, there's no need to spend more time than necessary at the computer. We all would probably like to spend more of that time out shooting. There are tons of keyboard shortcuts in Lightroom (as well as Photoshop) that can speed up your workflow. Learn them, use them, love them. They can help get you away from the computer faster and behind the camera more, and that's a great thing. 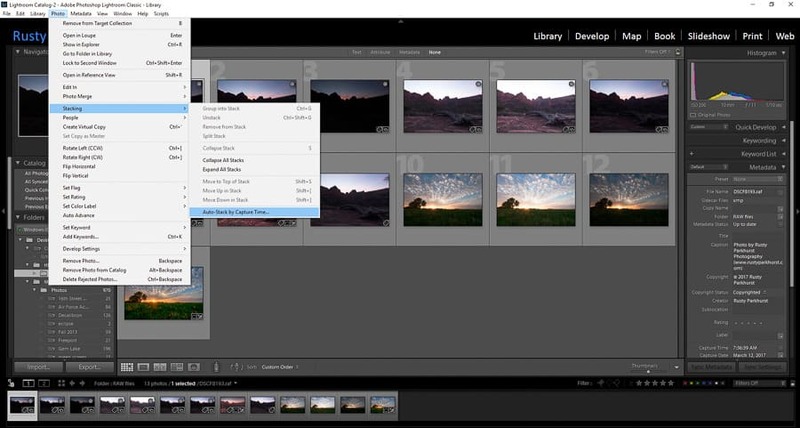 For more about some of Lightroom's shortcuts, check out this article. Creating HDRs in Lightroom really is a pretty easy thing to do. It is generally fast and doesn't require a trip into Photoshop or a plug-in, so give it a try for yourself. You may find that it works just fine for your needs. If not, there are plenty of other options for creating these images. Just beware that it is easy to overdo it and push HDR images too far, giving them the surreal look that many photographers don't like. Trust me, I've done it myself many times.